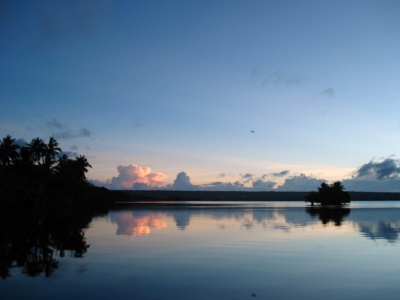 East Rennell is a stepping stone between Papua New Guinea and the Pacific islands. Because of this geographical location and its relatively undisturbed state it is a true natural laboratory. The designated area comprises the southern portion of Rennell Island in the Solomon Islands, the largest raised coral atoll in the world. Its Lake Tegano is the largest lake in the insular Pacific and contains a number of endemic species (banded sea snake for example). The island also has a high number of endemic birds. I visited East Rennell in 2007. 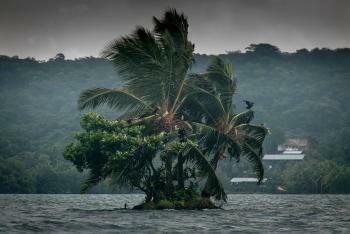 Without a doubt East Rennell is one of the most remote, and difficult to visit world heritage sites on Earth. To get there you need to fly from Honiara to Rennell. From there you then have to drive 20 miles on an unpaved road made of raised coral. We had EIGHT flat tires on our trip there. Once you get to Lake Tegano you've reached the world heritage area, but the lodges are on the other side of the lake, which requires a final trip by boat. Getting here is neither easy nor cheap, but it is a fantastic experience. Read more about East Rennell on my website. Rennel airstrip to Lake Tegano, on a WW2 coral based road. Well worth the visit to see this amazing fresh water lake with its huge artesian springs. Some of these are hidden in little inlets under the forest canopy, others more visible. And then there is the magical attol like islands dotted about the lake. Quite close to the sea at one end it's remarkable that it's fresh water. The few power boats on the lake were dragged by hand from the sea over a high ridge and then down some cliffs to the lake. The local villagers live a remote life with little interuption from the outside world. Be sure to leave ample time to get back to your flight out. This weekly flight is in itself is an occasion, interupting the children playing on the strip, not to mention the ducks wading in the puddles! Well worth the visit and not to be missed. Shame the lodge closed down but may well be re-opened since my visit. East Rennell is one of the most difficult to visit World Heritage Sites. I was there in the summer of 2007. Rennell is beautiful!! As an environmental scientist, living and working in the Solomons, I was amazed at the beauty and diversity of Rennell and the lake. However, logging and bauxite mining has been on the cards of the locals in West Rennell, and many in East fear it will destroy their World Heritage Listing. There is great potential for alternatives, as my work is attempting to currently faciltate, but without the understanding of Australian and European nationals, I fear the island could be lost to a cash-economy. Oil Spill: "On 4 February 2019, the bulk carrier MV Solomon Trader ran aground in Kangava Bay, Rennell Island, while loading bauxite ore. While the grounding and consecutive oil spill occurred just outside the World Heritage property, there is concern for a possible impact on the World Heritage site and the livelihoods of the local communities." Controversial at inscription: Land is under customary ownership - which was supported after a considerable debate. The delegate of Thailand dissociated himself from this decision.